In a word: I came to this strange world hoping I could learn a bit 'bout how to give and take. JM ate the beef bulgogi. Kristine ate the rock bowl bibimbop (without egg). 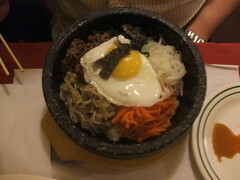 Kyle ate the rock bowl bibimbop (with egg). Nichole ate the chapjae with ginger tea. Nino ate the miso soup and pork bokum. We split the beef dumplings and tukbokgi. The bill was $69, or $13.80/person, plus tip. Kyle gave New Seoul an A-; Kristine gave New Seoul a B+; Nichole and JM gave New Seoul a B (see our grading rubric). New Seoul's slightly shabby interior shouldn't deter you from the rewarding eats inside. See if you can rustle up some dining companions, because it's more fun when you can sample a little bit of everything or share a giant bowl of junghol soup, served with its own burner. Dinner starts with a nice mix of spicy and pickled flavors in the little panchan dishes. 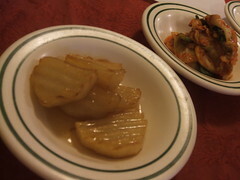 New Seoul offers kimchi, potato, fish cake and crunchy pickled radish, and when asked even shared some general recipes. We liked the large chunky daikon radish one especially - it was a good mix of hot and juicy and a bit sweet when you bit into it. The miso soup was standard issue, which is fine. No problems there. We were all grateful to Kyle for making sure the beef dumplings hit the table. They were nearly perfect, served very hot, with a nice contrast of chewy inside and crispy outside. If they had a stronger garlic or other savory component, they'd be even better. 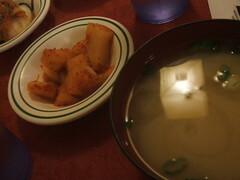 The tukbokgi, little tubes of pillowy rice paste, are a nice starchy appetizer, and a house specialty. Nino suggested we make sure to grab an onion for each bite of rice cake for the full flavor combo. The sauce was a good mix of spicy and tomato-y-ness. In summary: weird but good. Kristine, who is up on all the ways that your food can kill you, had some misgivings about un(der)cooked egg in her rock cooker bibimbap, but after seeing how Kyle's practically cooked itself she'd get it again, WITH the egg. In terms of flavor, Kyle actually found the dish to be a little bland, even with ample hot sauce (which incidentally wasn't all THAT hot). In terms of satisfaction and sustenance, the dish is pretty awesome. He loves eggs, and he loved stirring that egg into the veggies and beef. The crusty bits of rice at the bottom were a treat, and the aroma was fantastic and made the rest of the table jealous. He was surprised but not regretful that he ate the whole thing. The portion looked gigantic, but was so tasty it disappeared with almost no effort. The pork was juicy and tender. The spiciness, though listed as "**** SPICY ONLY", danced perfectly on the edge of being hot enough to wake up your mouth, but not so hot as to prevent you from wanting to eat more. Just right. Nichole got her standby, the chapjae of clear sweet potato noodles, and it was just OK. As with everything on the menu, it was less spicy than one would think. JM's beef bulgogi was a large piece of flat, salty beef, and was largely a one note dish. If JM didn't go into full-on gastronomic emergency whenever he ate hot sauce, he might've tried this dish with something spicy. He didn't mind his repast but he also wouldn't recommend it. Overall, New Seoul's offerings are really tasty and well-prepared. If you like your food hot, ask for extra heat; don't shy away from the raw egg, and expect generous portions for the price. The problem is, you picked dishes that are not supposed to be spicy in traditional Korean cuisine (besides pork bokum). Why, oh why did I come here right before my dinner break? Now all I want is that damned bibimbap, and there's no way I have time. I lived in South Korea for two years in the 80's (pre Olymics) and ate plenty of street food and family dinners. This place does a decent representation of the food. The last time I was there we suggested kimche on bratwurst instead of kraut and the staff totally got the pickled cabbage joke. Hmm.. As a Korean, I do not recommend New Seoul (and also Coreana). They put too much MSG in the food that makes you thirsty for quite a long time after you eat. It is definately not Koreans who is cooking.. The owner and and the waiters(waitresses) might be Korean, but I've seen the kitchen through the back entrance and they were not Korean.. I think the owner probably taught them in a literal way (telling them just steps on how to cook it)..without any sincerety or respect in making the food for the customers. Culturally, whoever makes Korean food must always cook the food with heart and passion, but I do not see any of that or cannot taste any of that in New Seoul and Coreana. The ambience is horrible too, it is not authentic, and I worry that Westerners who visit here might get a stereotypical view of "Oh, so this is how Korean restaurants looks like/food tastes like". Do not be fooled by other Koreans who goes there, they are simply going that place, including myself, because there are no other place to eat Korean food when we want the food on the menu that are too complicted for me to cook or simply don't have the right tools to cook certain specialties.. 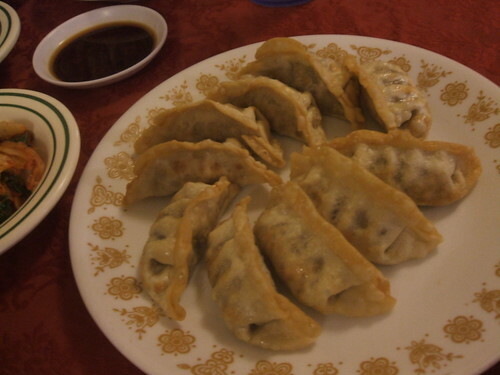 Sadly, in Madison, this is the best they can cook and Koreans have to appreciate that... I am thankful that there is Korean restaurant even in a small town of Madison, but at the same time I am mad and sad when compared to, especially the quality/interior design/freshness of food of Muramoto Japanese Restaurant (Japan, a long time rival but also friendly neighboring country), and I enter into New Seoul, feels like I am in the 80's style office building, and the food is not really authentic either. Or, simply, ask any Korean friends you see around here in Madison who loves to cook!! They are truly authentic + get the joy of watching the realtime house cooking!! I seriously guarantee that it will be million times better than going to New Seoul!! Good food is good food. If I wanted the most Korean food evar, you know where I'd go? Of course, but we're in America dude. I just get real tired real quick of diners and commentators slighting restaurants based on their degree of authenticity and best approximation of some platonic Ideal of "Korean food." The restaurateurs are Korean, yes? They've created the menu? Then it's Korean food in the way that matters. Calling their food a "decent representation" of Korean food is left-handed at best, and downright condescending at worst. Until the owners state that they're going for some kind of fusion cuisine, then I'm happy to interpret that this is their recipe for certain Korean dishes. I just went to New Seoul tonight for the first time, never having had Korean food before and realy enjoyed just about everything I tried. My dept at work is hosting a tour group from Korea, and they had not enjoyed much of the American food we had taken them out to so far. So, they insisted that we go for Korean tonight. They all were extreamly happy with the dinner and enjoyed introducing us to some of their food. They also enjoyed the chance to be able to talk to the waitresses, insted of just themselves or through the interperter. I would go again, in a heart beat. Question for ya. The "read more comments" thing you have: is that a new plugin for typepad or something? I love it, and I'd really like to get it implemented on a new typepad blog I'm developing. Feel free to email me if you don't want to post. We got that from TypepadHacks.com - I'll send you the template. I don't think JM knows how to eat the beef bulgogi he/she ordered. A one note dish? 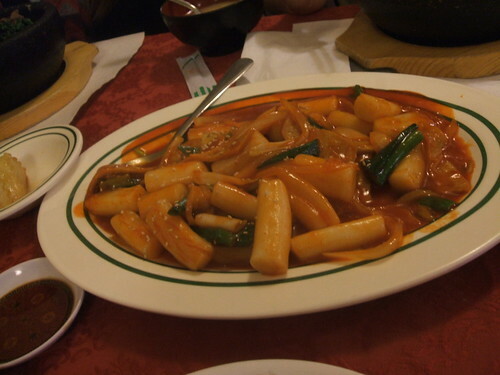 That's what the kimchi, potatoes, fish cake, etc was put on the table for. They don't just give that to everyone...it's for you to eat with the bulgogi. And the meat isn't 'salty', it's marinated. Oh, and to Lola, who commented that a restaurant isn't authentic unless the cooks share the ethnicity of the restaurant's food? Gimme a break. You've obviously never worked in restaurant kitchens before! As politically incorrect as this sounds, the kitchen help is, in fact, mostly Hispanic in mist cities. Even at your favorite fancy French restaurant! So according to you, in the US the only authentic restaurants possible are those serving Hispanic food. Ridiculous. New Seoul had good food with good portions at good prices. Eat there.